SDIP regional hubs bring together a wide range of local institutions and representative offices of SDIP members to tackle financing challenges at the local level. SDIP has put in place a regional hub in Africa and is currently exploring a hub in the ASEAN region. 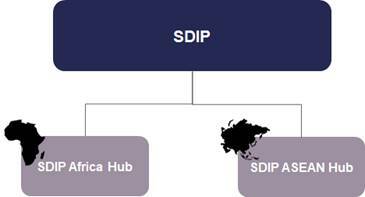 Personnel for the SDIP Africa Hub are located in Abidjan and Johannesburg. Further information on events held to advance the work of the SDIP Africa Hub can be found here and the SDIP ASEAN Hub here.